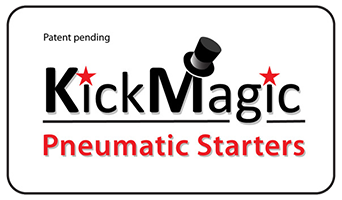 KickMagic is designed to work with either shop air or an on-board tank and regulator system. In many ways, shop air is the best way to get your bike going for the day. 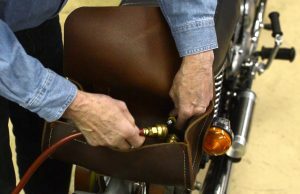 It is easy to plug in, you have more or less unlimited capacity, and if your bike starts hard or has some tuning and/or troubleshooting that needs to be done, you can save your on-board tank’s air for when you are out on a ride. Most home or “shop air” compressors are rated at 140 to 150 psi max output, which is compatible with KickMagic. (Please note overpressure WARNINGS in the manual). However, the KickMagic system typically operates in the 80 to 100 psi range depending upon the motor condition, compression ratio and so on. 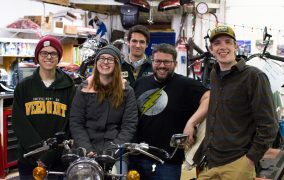 You’ll determine this input pressure once for your bike and then set your shop air regulator to this setting. Like all pneumatic systems, pressure, storage volume, hose diameter and flow rate are the key. While a 12VDC emergency tire inflator compressor will not be sufficient, a compact, “pancake” style 115VAC unit will be just fine. 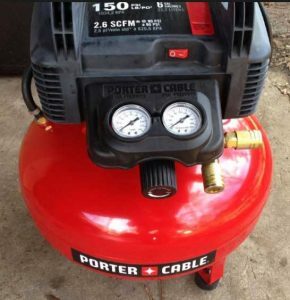 Porter Cable, for example, sells a unit rated at 150 psi, with a 6 gallon tank, ¼” ID hose and a flow of 2.8 SCFM at 90 psi for under $100. If you have a compressor already, great! If not, get one ….you’ll use it for a hundred other things. Bigger compressors and tanks just mean more “stored start attempts” before the compressor motor turns on to replenish the air. Whether a pancake style or a full-sized industrial beast, you won’t come close to wearing it out using KickMagic. For you techy types, you can calculate your stored start capacity by assuming each start attempt will utilize 25 cu in of air at 90 psi and go from there! (Hint – there are 1,400 cubic inches in a 6 gallon tank). If you have questions about your system, contact us to discuss. KickMagic on board, stored air systems are manufactured in the US by Ninja Corporation to KickMagic specifications. The carbon fiber, DOT tanks are rated at 4500 psi and come in 50, 68 and 90 cu in sizes. 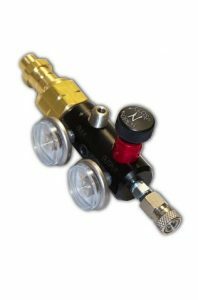 Each tank comes with a KickMagic specified, high-pressure regulator permanently attached. There are several options for filling these tanks. Please note that the tanks are compatible with high-pressure air or nitrogen, but not rated for for use with CO2 currently (we are working on it however…stay tuned). Commercial Fill Stations: These range from paintball ranges & suppliers to scuba shops to industrial air suppliers. 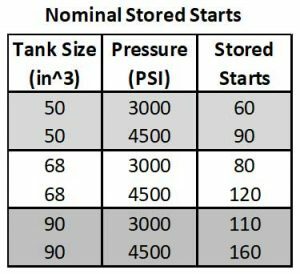 Depending upon the facility, charge pressures will normally be 3000 or 4500 psi and will yield the “stored start attempts” shown in the chart for the three tank sizes. Refills are nominally $5 to $10. There are over 10 million paint ball players in the US along with 3 million active scuba divers (these are true stats! ), so once you find those guys in your area, they’ll direct you to where the fill stations are. For the occasional user, this option, combined with owning a few extra tanks to swap out, is the easiest and most cost effective solution. 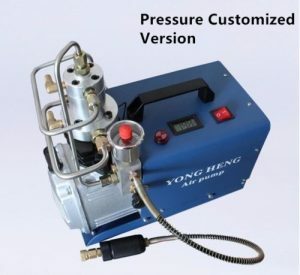 High Pressure Fill Station (HPFS): This device, manufactured by Ninja, allows direct transfer of up to 5,000 psi air from a storage tank to your tank. This is the system we use at CBE. Our local industrial air supplier fills our large storage tank to 2,500 psi. We then fill out tanks until the pressure falls below 1500 psi and then recharge. Dealers and clubs may opt to buy one tank and one HPFS to share across multiple KickMagic systems. 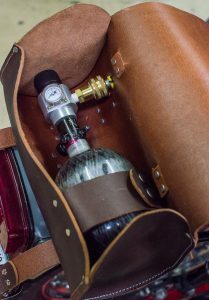 Similar arrangements can be made using scuba tanks and specialized refill regulators. Home High Pressure System: There are systems now on the market for home use (300 Bar/4500 psi). They retail on eBay for about $250 plus shipping from China and have good reviews. Again, a good solution for a group or dealer to share the investment. We do not have direct experience with these devices, but the paintballers seem to love them. Do your homework and, if you get one, let us know how it goes!